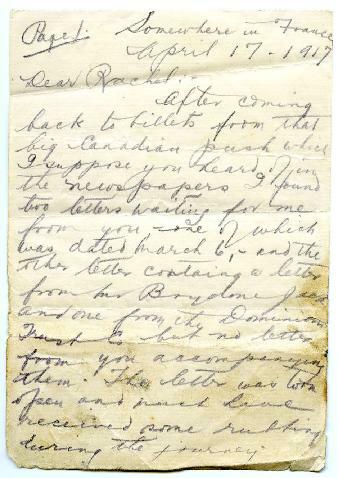 Letter from Private Edward Joseph Seidelman, dated April 17, 1917. Sent from "Somewhere in France" to Rachel Seidelman of Vancouver. The Field Post Office stamp on the envelope is dated October 19, 1917, suggesting that the letter may possibly have been sent later in the Fall of 1917. Some content on Page 2 is missing a portion of the paper on the bottom of Page 2 has been physically cut off.